Northwest Oklahoma boasts some of the best stargazing in the country. Fewer places on earth are more perfect for stargazing than Black Mesa State Park. With no nearby town centers to pollute your view with city lights, this isolated high plains paradise in the far western Oklahoma panhandle is truly ideal for looking up at the night sky in wonder. The area is home to the Okie-Tex Star Party, a gathering of astronomy buffs who journey to this incredible part of the world every year for a true stargazing blowout. The event brings people from all over the world to this remote corner of Oklahoma for its unbeatable star clarity. Marked by lush rolling forests, rocky bluffs and peaceful waters, Osage Hills State Park in northeastern Oklahoma is a sight to behold in the daytime—but you’ll really see what makes this place special when the sun goes down. Whether you book a stay at one of the park’s rustic cabins or sleep outside in a cozy tent, you’ll enjoy unspoiled views of the starry expanse overhead at this beloved state park in the heart of the Osage Nation. For a different kind of star power, check out the Pioneer Woman Mercantile in the nearby town of Pawhuska. Enjoy delectable comfort fare inspired by the Food Network star and browse a variety of Oklahoma-centric items at this popular shopping and dining destination. Make a weekend out of it with the Pioneer Woman Road Trip and check out can’t-miss stops like the Joseph H. Williams Tallgrass Prairie Preserve, the one-of-a-kind Woolaroc Museum & Wildlife Preserve, the Frank Lloyd Wright-designed Price Tower in Bartlesville and a whole lot more. Tenkiller State Park in eastern Oklahoma is a great place to marvel at the heavens under a dark night sky. Strike out on your own solo excursion, or come during October for the Stargazing at Tenkiller event. Presented by the Oklahoma City Astronomy Club, this two-night star party is a great way to learn more about astronomy while enjoying a dazzling celestial show that’s truly out of this world. Experts will be on hand with presentations and activities that are sure to enrich your stargazing adventure in this gorgeous stretch of eastern Oklahoma. Tenkiller isn’t the only stargazing hotspot in the region. Take a short trip west to Carlton Landing on beautiful Lake Eufaula, where you can escape the hustle and bustle with a weekend getaway at one of the property’s charming and cozy cottages. You’ll definitely want to check out Lake Eufaula State Park, a premier outdoor destination anchored by the largest lake in the state. The area offers excellent stargazing opportunities, but the sky isn’t the only source of wonder here. Stop by the Eufaula Inspiration Garden during your trip and take in a vibrant landscape of floral arrangements for maximum peace and relaxation during your next stargazing getaway. Far away from the big city lights to the east, northwestern Oklahoma is a wide-open expanse of rugged red dirt plains offering an incredible canvas for the stars above to really do their thing. The areas surrounding the small towns of Freedom and Waynoka are particularly good for taking in the show, featuring some of the state’s most unique state parks and unspoiled views of the night sky. One trip to this amazing part of the state and you’ll see why it’s ideal for getting away from the distractions of daily life and re-centering yourself under the stars. You’ll definitely want to make a stop at Alabaster Caverns State Park, where you can pay a visit to the Selman Bat Cave Wildlife Management Area and witness the majestic flight of Mexican free-tailed bats as they return to the area every summer. Little Sahara State Park in Waynoka, where you can marvel at 1,600 acres of sand dunes washed in moonlight, offers more unbelievable nighttime views. Whether you join one of the orchestrated “star parties” in remote corners of the state or strike out on your own stargazing adventure, come to Oklahoma and see the universe in a whole new light. The shortgrass prairie of central Oklahoma gives way to rolling red hills and canyons in the outdoor paradise of Roman Nose State Park, an excellent place to gaze at the stars in wonder. One of the state's original seven state parks, Roman Nose offers diverse terrain, three natural springs and breathtaking views of gypsum cliffs and canyons. Set up at one of the park's 33 tent campsites, or grab a room at the renovated, 22-room Roman Nose State Park Lodge. (You can even rent a teepee between April and October, if you're looking for some unique lodging during your stargazing getaway.) Located just a short drive west of Oklahoma City, this state park gem is a great option for city dwellers looking to get away from it all. A visit to Roman Nose State Park is a great excuse for a Route 66 road trip. If you're leaving from OKC, be sure and grab a selfie with the fun and quirky Milk Bottle Grocery before heading west for onion burgers in El Reno. Lucille's Service Station—one of only two upper-story, out-thrust porch style stations left on Oklahoma's stretch of Route 66—offers another great photo opportunity a little further west. Be sure and pop into the Cherokee Trading Post & Travel Mart in Calumet before heading north toward Roman Nose State Park, where you can re-fuel, browse the Native-themed gift shop and even see a live bison herd that grazes nearby on the property. A trip on this beckoning stretch of the Mother Road is the perfect way to kick off your next stargazing adventure. 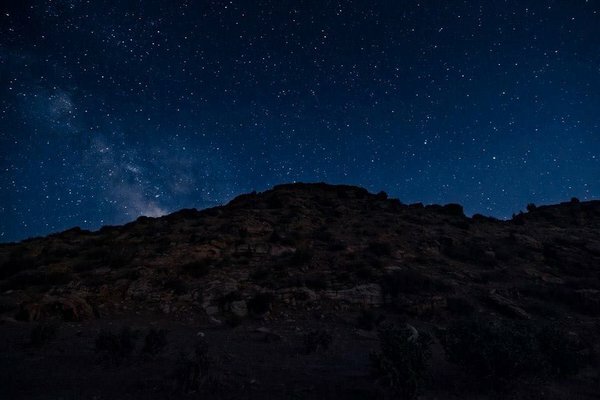 If you're looking for somewhere to really connect with the great wide wonder of the night sky, it's hard to beat the Wichita Mountains Wildlife Refuge. This 59,000-acre refuge and recreation area in southwestern Oklahoma, a prairie oasis rippled with stunning granite mountains (among the oldest on the planet), is an ideal spot for solitude and crystal-clear star clarity. Backcountry camping on Charon’s Garden Trail is the best way to get the most out of the night sky. Not only is this area free of pesky light pollution, but no more than 10 people are issued a camping permit for any three-day span—so your odds of bumping into another group are pretty slim. Travel to the mountainside community of Medicine Park after your night under the stars and check out the quaint restaurants and shops lining its historic cobblestone streets. Grab a bite at The Old Plantation before taking a short drive west to the Holy City of the Wichitas, a stunning slice of Old Jerusalem tucked into the boulder-strewn foothills of the Wichita Mountains. Serving as a gateway to southeastern Oklahoma’s Choctaw Country along the southwestern edge of the Ouachita Mountains, McGee Creek State Park is a secluded and scenic getaway you won’t forget. This 2,600-acre park is an excellent place to lose yourself under star cover, surrounded by rolling, wooded hills and rock formations. Cast your line at the McGee Creek Reservoir for bass and catfish by day, then kick back after the sun goes down and cast your eyes skyward. With more than 200 primitive campsites throughout the park, you’ve got plenty of opportunities to connect with nature in the open air, but you might also choose to stay in one of eight rustic lake huts. Each 12-ft x 24-ft structure includes a back porch overlooking the lake, bunk beds, a fireplace and air conditioning, making it a great option for a cozy state park stay with all the comforts of home. A stargazing trip to McGee Creek State Park is a fantastic way to kick off a road trip on the Kiamichi Trace. Stretching from the banks of the Red River to Fort Smith, Arkansas, this stretch of US Hwy 271 was once a military trail but is now a scenic drive loaded with can’t-miss attractions. Check out one-of-a-kind roadside oddities like Showman’s Rest at Mount Olivet Cemetery in Hugo—where you can see the final resting place of circus performers who once spent winters in the area—and explore the fascinating Spiro Mounds Archeological Center near the Arkansas border, the only prehistoric Native American archeological site open to the public in Oklahoma. The Talimena National Scenic Byway is best known as one of Oklahoma's most breathtaking drives, but the surrounding area is also excellent for stargazing. Explore the rolling wooded timber of the Ouachita National Forest by day, then watch as the sky comes to life in a vivid dance of shimmering stars after the sun sets. The Cedar Lake National Recreation Area is a particularly great place to take in the sights. You'll feel small in the best way after a night under the stars in this beautiful area. After sunrise, get ready for more breathtaking sights as you marvel at scenic vistas, explore miles of hiking trails or just kick back and enjoy some R&R at your campsite. If traditional camping isn’t quite your thing, check out some of the area’s great lodging options. For something a little more distinctive, stay the night in a 27-foot teepee at Copper Sky Ranch, one of Oklahoma’s many unique and quirky places to stay. Those looking for indoor amenities will want to book a room at the Billy Creek Cabins in Muse, a large two-bedroom property where you can explore the Billy Creek Recreation Area and take in views of the starlit Ouachita Mountains from the comfort of your screened-in porch. Come see what makes this beautiful area of the state a great place to look up at the stars.